The Yogi Cookie is my favourite post workout snack . This healthy cookie is packed with wholesome ingredients to help your body recover and give you “superpowers” :). 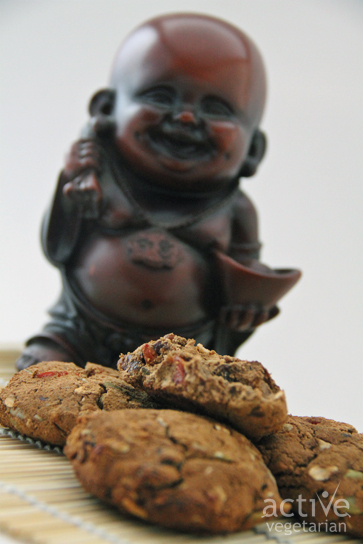 These cookies make a great after-yoga snack full of things to give you that additional boost of energy you may need. They also make a nice, healthy dessert when you’re craving something sweet. Enjoy! 2. Line two cookie sheets with parchment paper. If you don’t have parchment. 3. In a large bowl, combine spelt flour, cinnamon, salt and baking soda. Mix well. 4. 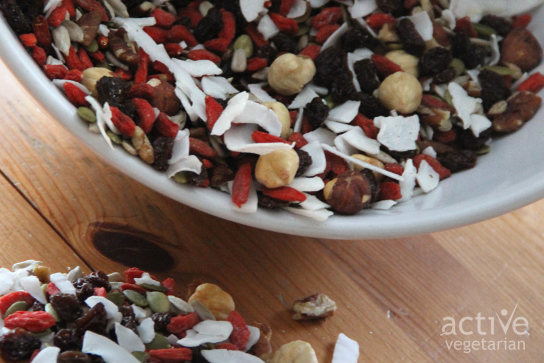 Add in oats, seeds, nuts, coconut and dried fruit. Stir to combine. 5. In a medium sized bowl mix molasses, milk and coconut oil. Beat until well blended. 6. Add to dry mixture in 1/3 increments stirring until fully combined between each addition. 7. If the mixture is too wet to form cookies, add extra flour in one tablespoon increments. 8. Form large cookies and place on baking sheets. 9. Bake for approximately 20 minutes depending on the size of your cookies. Cookies are done when the edges start to turn golden and the tops are set. 10. Cool on baking sheet for 5 minutes before transferring to wire racks to cool completely.